Gambia was ordered under the 1938 Naval Programme and was one of seven cruisers planned for this class. This was a new cruiser design for the Royal Navy and it met the requirements of the 1936 London Naval Treaty that restricted displacement to 8,000 tons. On 22 September 1943 HMNZS Gambia was commissioned for service with the Royal New Zealand Navy. Aircraft: Two Walrus seaplanes – as built Gambia was fitted with two aircraft and a catapult but these were removed in 1943 prior to service with the RNZN. In 1943, both of the New Zealand Navy’s two cruisers, Achilles and Leander were damaged in the Solomon Islands campaign, this being compounded by an explosion on board Achilles in June of that year, while in dockyard hands. 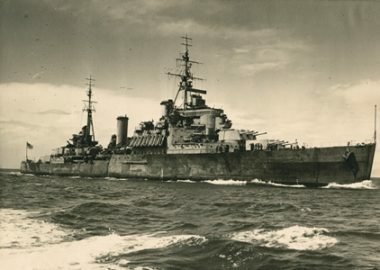 Following discussions with the Admiralty, it was decided that New Zealand would commission a near new cruiser of the Fiji class which was then undergoing refit. Accordingly, the men standing by to recommission Achilles were drafted to commission HMS Gambia while the crew of Leander travelled to Britain and recommissioned Achilles. Gambia remains to the present day the largest warship to have served with the Royal New Zealand Navy. Gambia was ordered under the 1938 Naval Programme and was one of seven cruisers planned for this class. This was a new cruiser design for the Royal Navy and it met the requirements of the 1936 London Naval Treaty that restricted displacement to 8,000 tons. The armament followed the Town-class cruisers e.g. HMS Southampton. The armouring followed that of HMS Belfast. Gambia was been laid down in 1939, in the yard of Swan Hunter & Wignam Richardson at Wallsend on Tyne. She was the seventh to be laid down. She was launched on 30 November 1940 but was not completed until 21 February 1942 and was commissioned in the same month. Her first deployment was with the Eastern Fleet which included the assault on Madagascar, Operation IRONCLAD. In early 1943 she was deployed to the East Indies. She then returned to Britain for a refit and modernisation. This work included the removal of the two aircraft and the upgrading of radar and communications for antiaircraft duties. One of the cranes was retained to handle the ship’s boats and the hangar was converted into offices and a cinema as it had been on other ships that had their aircraft removed. Her anti-aircraft defences were revamped during her wartime service. Two 20mm guns on X-turret was insufficient AA defence for a ship of her type. More pom-poms were added including single pom-poms which was very unusual for a cruiser in 1942. After emerging from refit in November 1942, all the single mount 20mm and pom-poms had been removed and replaced with ten twin 20mm power-operated mountings. Gambia had a very excellent radar system. She was fitted with the Type 273 for surface warning and the Type 281 for air warning at the masthead. Due some issues with coverage of the Type 273, it was replaced with a lower-powered Type 272. The 6-inch turrets director was fitted with a Type 284; the secondary high-angle director for the 4-inch AA guns was Type 285. The pom-poms were controlled by Type 282 radar. Also in 1943 Type 283 radar was fitted to the blind-fire barrage directors for the 6-inch guns. When it was agreed that Gambia would be lent to the RNZN, she remained for service with the Home Fleet. On 22 September 1943 HMNZS Gambia was commissioned for service with the Royal New Zealand Navy, under Captain N.J.W. William-Powlett DSC, RN. However, the formal transfer did not take place until 8 May 1944, the date that Leander reverted to the Royal Navy. After working-up at Scapa Flow Gambia was employed in the Atlantic on anti-blockade runner duties until the end of 1943. At the end of January 1944 the ship sailed to join the Eastern Fleet, joining the 4th Cruiser Squadron at Trincomalee, Ceylon (now Sri Lanka) on 19 February. Gambia then participated in further operations against blockade runners, this time in the Indian Ocean, until late March. At this time the Eastern Fleet was being built-up in preparation for operations against the Japanese. The first of these in which Gambia participated was a carrier raid on Sabang in April 1944, which was followed by a similar raid on Surabaya in May. Other operations of this kind were conducted by the Fleet, in co-operation with United States Navy forces over the next few months. After a short refit in September Gambia was at Trincomalee on 6 October, when HMNZS Achilles arrived to join the Eastern Fleet. Ten days later, having embarked a number of passengers, Gambia sailed for Australia and New Zealand, arriving in Wellington on 4 November. At the end of that month the Eastern Fleet was re-designated the British Pacific Fleet. Gambia had a five week refit at Auckland in December and following some New Zealand port visits, was joined by part of the Fleet, including the flagship, HMS Howe and HMNZS Achilles, at Auckland at the beginning of February 1945. After exercises in the Hauraki Gulf the ships left for Sydney and then proceeded on to the advance base at Manus Island. Following exercises out of Manus Gambia was again involved in operations at the end of March. At this time the task of the British Pacific Fleet was to attack Japanese installations and facilities on the Sakishima group of Islands, thereby preventing aircraft from there joining in the defence of Okinawa. Gambia was a part of the anti-aircraft screen around the carriers. During these operations the Fleet was attacked by kamikazes for the first time. On 31 March one of the destroyers HMS Ulster was disabled by a near miss and on the 1st of April Gambia was ordered to take it in tow. Three days later, having achieved an average towing speed of 8 knots the ships arrived at Leyte Gulf in the Philippines. This tow, of 760 miles was the longest of its type at the time and throughout there was danger of attack from Japanese submarines. Gambia then rejoined the Fleet, which was still conducting operations against the Sakishima group of islands. Air attacks on the Force were frequent and on 13 April Gambia accidentally shot down a United States Navy Hellcat fighter with the port pom-pom during one of these attacks. Operations continued until the 20th, when the Fleet proceeded to Leyte Gulf for rest. After some 62 days at sea the brickwork of Gambia’s boilers was in need of repair along with the boilers themselves. This was due to the hard steaming during the deployment and the need for high speeds during operations. Task Force 57, as the British Pacific Fleet was designated, sailed again on the 1st of May to resume operations against the Sakishima group. Operations this time included a bombardment of the Nobara airstrip by Gambia and HMS Swiftsure, during which Gambia fired 230 rounds of 6-inch shells. The strikes against Sakishima continued until the 25th when the Fleet again went to Leyte Gulf for rest. Gambia was detached on the 30th to proceed to Sydney for refit, arriving there on 5 June. Gambia sailed to rejoin the Fleet on 28 June, which by this time was operating off Japan and had been Redesignated Task Force 37. Again the main task of the ship was screening the carriers, which were conducting strikes against mainland Japan. The last bombardment of Japan took place on 9 August the day when the atomic bomb was dropped on Nagasaki) with Gambia firing on the steel works at Kaimashi, on Honshu Island. On their way back to the Task Force the bombarding group was attacked by Japanese aircraft, one of which was shot down by the Gambia. On 15 August the ceasefire was announced and during the time that the signal was being received a Japanese aircraft attacked the force, being shot down by a US Navy Corsair, pieces of the aircraft falling on Gambia. The ship also engaged the aircraft, and together with the rounds fired in the bombardment, Gambia has the distinction of firing the last shots of the Second World War. A platoon of Royal Marines and a platoon of seamen landed under the command of Lieutenant-Commander G.R. Davis-Goff DSC, RNZN on 20 August and took the surrender of the Japanese Naval Base at Yokosuka. Some ships of the British Pacific Fleet had anchored in Tokyo Bay on 31 August and on 2 September 1945, the Japanese signed the instrument of surrender on board USS Missouri. Gambia represented the Royal New Zealand Navy at this historic occasion. Gambia assisted in the evacuation of released Prisoners of War from Wakayma to Tokyo in mid September as well undertaking other more mundane duties. The ship sailed from Japan on 11 October, arriving in Auckland on the 30th. After a six week refit Gambia remained at Auckland, non operational, until February 1946. The ship was recommissioned with a steaming party on 8 February and sailed for Sydney on the 12th. At Sydney many of the New Zealanders on board were drafted off and the ship’s company made up from British ratings being returned to the United Kingdom. With about 1000 men on board Gambia sailed from Sydney, via Melbourne, where a large quantity of gold bullion was embarked, for England, by way of the Suez Canal. On 27 March the ship arrived at Spithead and after a refit Gambia was paid off from the Royal New Zealand Navy on 1 July 1946. After being recommissioned into the Royal Navy, Gambia served with the Mediterranean and East Indies Stations. Her X-turret was removed and replaced by two AA mountings. She returned to Britain in 1956 for a refit. All her 20mm guns were replaced by twin mounted Mark 5 Bofors guns. The bridge was also enclosed. She was recommissioned on 1 May 1957 at Rosyth. She was designated at this time as the flagship for the East Indies Station based at the Aden naval base. Due to her age, it was not economical to modernise the cruiser any further so when Gambia returned to Portsmouth on 4 July 1960 she was paid off into reserve in December 1960. HMS Gambia was sold in 1968, leaving Portsmouth under tow on 2 December 1968. She was broken up in 1969 at Inverkeithing, Firth of Forth by T.W. Ward. The badge of Gambia was designed for the first ship to bear the name, a Fiji-Class cruiser launched in 1940 and commissioned into the Royal New Zealand Navy in 1943. The central feature is taken from the Arms of the Colony of Gambia, after which the ship was named. This badge was one of those affected by the wartime decision that all new badges would have a circular surround. It is notable that post war unofficial reproductions of the badge have the incorrect, pentagonal surround. The badge was approved on 1 March 1943. GAMBIA: A former British colony situated on the West coast of Africa and now an independent nation.